Hezbollah leader: "What Der Spiegel wrote ... is nothing but an Israeli accusation"
(CNN) -- Hezbollah's leader accused a German magazine of engaging in a conspiracy with Israel and the West after it reported that the militia group orchestrated the assassination of former Lebanese Prime Minister Rafik Hariri. 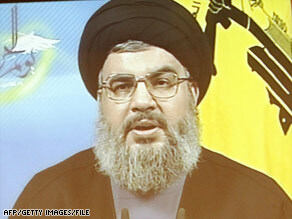 Hezbollah leader Hassan Nasrallah gives a televised address in January. "In regards to the Der Spiegel article, I want to say that the conspiracy is there," Hassan Nasrallah said during a speech in Beirut, Lebanon, on Monday. "What Der Spiegel wrote about our involvement in the Hariri assassination is nothing but an Israeli accusation, and we will deal with it on that basis," he added. The magazine report is intended to influence the outcome of the upcoming elections in Lebanon, Nasrallah said Monday. A Hezbollah-led alliance is running against a U.S.-backed parliamentary majority in elections scheduled for June 7. "It is all about the timing; the Israelis and Americans are talking about their worries of these elections. So what can they do? Here, they have Der Spiegel ready," he said. He added later: "The danger here is not in the timing but in the strategy. When Hariri was assassinated, they wanted to first accuse the Shiites of the crimes. Now they are accusing Hezbollah. They are telling the Sunnis that whether you like Hariri or not, Hezbollah is the one who killed your leader. Your revenge is with them, your war is with them, so go and fight them. They are your new enemies." Hezbollah, a Shiite group which is supported by both Syria and Iran, is considered a terrorist organization by the United States. The group declared victory over Israel after a 34-day military conflict in 2006 and gained more political power. Some analysts think it may lead Lebanon's government after the June elections. The German magazine reported Saturday that a U.N. tribunal has uncovered evidence that Hezbollah "planned and executed" the car bombing that killed Hariri and 22 others in Beirut on Valentine's Day in 2005. The report prompted Israeli officials to say Nasrallah should face criminal charges if the evidence points to Hezbollah. "If this is the conclusion of the investigators, an international arrest warrant should be issued immediately for Nasrallah," Israeli Foreign Minister Avigdor Lieberman said Sunday before Israel's weekly Cabinet meeting. "He must be brought before an international court of law." Nasrallah dismissed such a notion, saying, "All of a sudden [the Israelis] are representing mercy and justice, and they are the ones defending the Sunnis and the Lebanese." Radhia Achouri, a spokeswoman for the U.N. tribunal, said its policy is to not address media speculation. The tribunal at The Hague, Netherlands, will not "be dragged into a debate in the media about where the investigation stands," she said. Achouri added the media should rely on official information issued by the tribunal. The U.N. body began its investigation into Hariri's death in March, and the case is expected to be ready for trial by 2010. At the time of Hariri's death, neighboring Syria had immense political influence in Lebanon. Hariri was admired for spearheading the rebuilding of Beirut after the country's civil war, which took place from 1975 to 1990. Many Lebanese blamed Syria for the killing, citing Hariri's patriotism and strong sense of Lebanese independence. Soon after the blast, U.N. investigators tasked to probe the attack found links between Syria's government and Hariri's assassination. But in Der Spiegel's report -- based entirely on unnamed sources -- the magazine says the new evidence points not to the Syrians, but to Hezbollah. The magazine said investigators reached their conclusion based on mobile phone use at the time of Hariri's death. The phones, it said, were used exclusively for communications between the alleged assassins except for one occasion when a suspect called a girlfriend. Tracing that single call, investigators figured out the name of the operative, who belonged to a "special forces" unit of Hezbollah, the magazine said. Officials were then able to link him to Hezbollah higher-ups, it said.